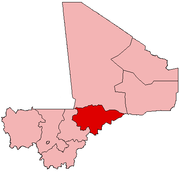 Borko is a village and rural commune in the Cercle of Bandiagara of the Mopti Region of Mali. 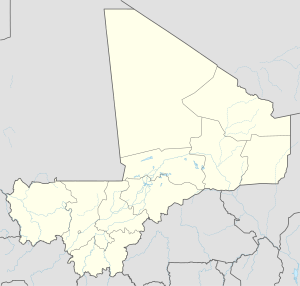 The village lies on the edge of the Dogon Plateau, 105 km northwest of Mopti and 73 km north-northwest of Bandiagara. In the 2009 census the commune had a population of 6,254. The village is set in a valley, and is only accessible by one entrance. The unique farming style is visible in the lower left corner. The bridge was built by German engineers in 2007-2008 and now provides direct road access to Bandiagara. ^ Resultats Provisoires RGPH 2009 (Région de Mopti) (PDF) (in French), République de Mali: Institut National de la Statistique, archived from the original (PDF) on 2012-09-19 . Plan de Sécurité Alimentaire Commune Rurale de Borko 2006-2010 (PDF) (in French), Commissariat à la Sécurité Alimentaire, République du Mali, USAID-Mali, 2006, archived from the original (PDF) on 2012-09-17, retrieved 2012-04-25 . This page was last edited on 10 November 2018, at 03:50 (UTC).